14" Nanette by R&B - This doll is identified in several books as one of the Madame Alexander dolls from the "Fashions of a Century" series. Books are a great source of information and research. With dolls, for decades it was, besides word of mouth, the primary way to find information. The 1970s and 80s saw a number of the trailblazing books covering the dolls by Madame Alexander. Pre-computers, a great deal of work and research was done by these pioneers. Alas, mistakes were made, and often the next books published repeated some of these errors, to be passed on. Rodney Waller is working on a new article in two parts for MADC magazine, THE REVIEW, that addresses this very issue. Even today, sometimes old mistakes have become part of the lore of certain dolls. Rodney looks at some of these long-time gaffes, and with Playtime Magazine, old department store, newspaper ads, and catalogs to help correct some prominent identifications. 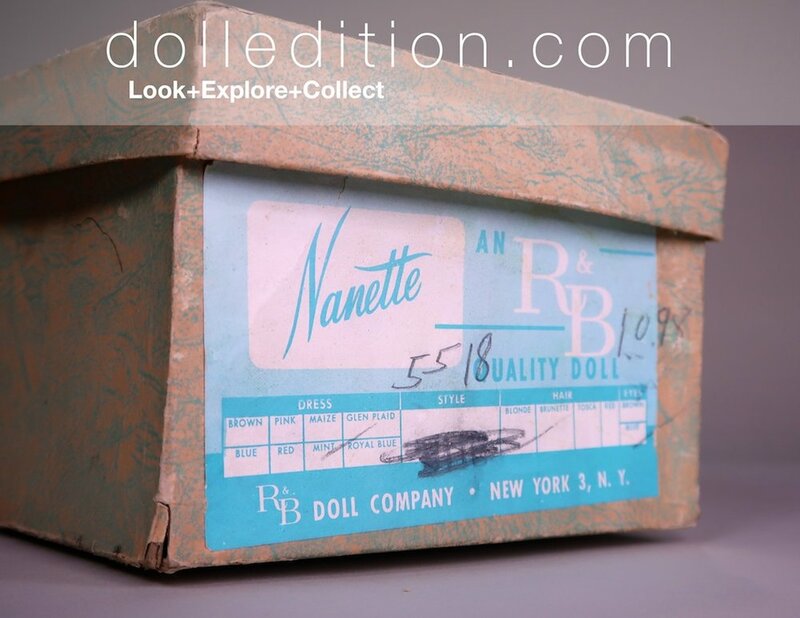 Featured here is a 14 inch 1954 Nanette that is sometimes referred to as "1920," a doll attributed to the Madame Alexander "Fashions of a Century" series. So prevalent is this particular misidentification, the doll even shows up in doll competitions as a rare Madame Alexander doll. The owners are going by what information they have, which is sometimes misinformation passed on and on. R&B, also known as Arranbee Doll Co. was part of the American doll manufacturing playing field of the 1920s, 30s, and 50s. It became part of Vogue Dolls in 1958. In these early years of hard plastic, Alexander Doll Company, American Character Doll Company, and Arranbee Doll Company used common factory space, sharing some of the same body and limb molds. Similar but different, the levels of finishes and costuming, being for different markets, was not the same from company to company. During the early introduction of hard plastic dolls of the 1950s, Alexander, R&B and American Character Doll Companies shared factory space. The brocade fabric used on this Nanette gown was also used by Alexander. R&B and Alexander used some of the same floss doll wigs for their dolls. R&B, also known as Arranbee Doll Co. was part of the American doll manufacturing playing field of the 1920s, 30s and 50s. It became part of Vogue Dolls in 1958. Pat Smith, 1978, identifies this Nanette as Madame Alexander, "Fashions of a Century." The book, "Arranbee Dolls" published in 2004, has the correct identification for Nanette. Madame Alexander "Fashions of a Century" - this series came on the market late 1954 into 1955.